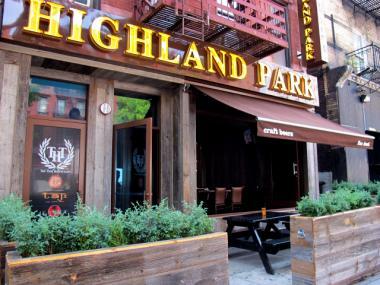 Highland Park, on East 34th Street between Second and Third avenues, is the old Bar XII, all grown up. MURRAY HILL — It's forward progress for this Murray Hill sports bar. After a week of intense construction and remodeling, Bar XII, a neighborhood mainstay that once catered to Bud-swilling recent college grads, has emerged as sophisticated gastropub Highland Park. What Bar XII did have was crowds of recent college grads, same as the rest of its Murray Hill counterparts, who were ready to throw down buckets of cash for pitchers of beer. The establishment’s last day as Bar XII was Saturday, Aug. 6. The owners, who operate two other restaurants, immediately got to work on the overhaul and by the following Friday, the bar had reopened as Highland Park. In less than a week, the sports bar became a gastropub with a refined twist, Moltane said. The bar’s owners decided to strip away all the red plaster and mirrors and replace them with naturally aged wood reclaimed from an old barn in Pennsylvania. Leather sofas line a back wall of the bar, and 28 televisions hang from the ceiling. Chef Nadia Day joined the bar’s staff and drafted a booze-infused menu complete with dishes like bourbon stout-braised oxtail and Brooklyn Lager-braised chicken. A revised drink menu includes cocktails like mojitos mixed with bourbon and craft beers from all over the world, Moltane said. The bar has started to serve beer flights, which allow customers to sample four 5-ounce cups of different lagers. And it has purchased growlers, giant glass jugs that keep four pints of beer frosty for hours, Moltane said. “[The change] was admittedly a risk considering how popular and successful Bar XII was,” Moltane said.